Guided tours, accompanied by a graduate student docent, are available for school and youth groups during the school year. The tours are scheduled upon availability of a docent. Visit T. rex, Pteranodon and more! 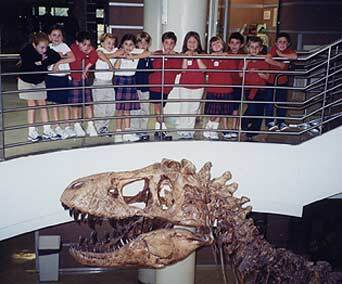 Guided tours, accompanied by a graduate student docent, are available for school and youth groups. Tours are most appropriate for students at the second grade level or higher. Group tours are scheduled depending upon availability of the docents. Maximum number of students per group is 25. Please note: we do not give tours during the summer months (June–August). The tour will include an introduction to the museum, a slide show on “The Making of T. rex” and a discussion of the dinosaurs, pterosaur, and other fossils on display in the atrium. There is a $50 docent fee, paid by check directly to the docent. This tour includes the T. rex and slide show plus a closer look at fossils and the fossilization process in one of the science labs. The cost of this tour is $100, again paid directly to the docent. To schedule a guided tour of T. rex and “friends,” please fill out our Tour Request Form (Microsoft Word Format) and e-mail back as an attachment to Chris Mejia. To print out the form and fax back your request, please use our Tour Request Fax Form (Adobe Reader is necessary to view this format and can be downloaded for free here). UCMP is located in room 1101 of the Valley Life Sciences Building on the UC Berkeley campus. The use of public transportation is encouraged. Transit route maps, schedules, and parking information are available from the Parking & Transportation Office.